With long experience of these issues, Rev. Dr. Marcus Braybrooke, President of the World Congress of Faiths, was an excellent Chair for this Session on 'Religious Freedom - Global Issues'. He commented that, “It is appropriate today that we are having this discussion and the House of Lords are having (the Archbishop of Canterbury) debate on the rights of religious minorities in the Middle East, affirming that religious freedom is a basic human right. Faith communities themselves have much yet to learn about tolerance of other communities. They should move away from the historic exclusivism." A speech entitled 'Religious Persecution in Pakistan' (full speech link) by Shiekh Rahman gave a personal and moving account of the persecution experienced in Pakistan by religious minorities. Particularly pressing upon the exclusion and violence experienced by his own religious community, the Ahmadiyya Muslims. Peter Zoehrer gave an account of religious persecution currently occurring in Japan. 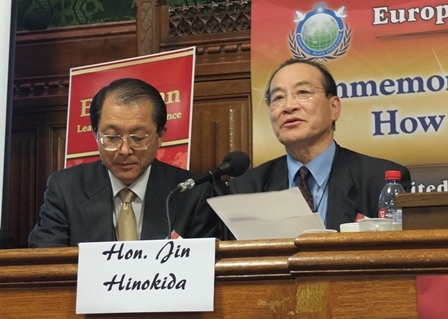 He described it as a “hidden human rights crime” of forced conversions and kidnappings of more than 4300 believers – predominantly Unification Church members, but also more than 100 Jehovah Witnesses leaving those who go through such ordeals are left psychologically traumatised and in some cases, physically decimated. 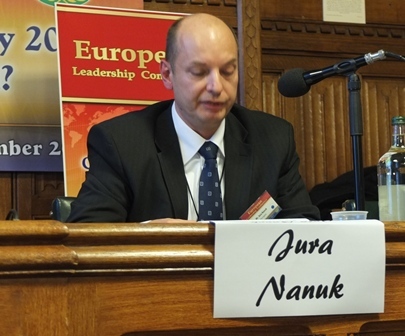 Jura Nanuk, Deputy President, Croatian Religious Liberty Association, reported on the anti-religious legislation passed in the Hungarian parliament on 14/07/2011, that grants the government the right to determine whether a religious community could enjoy religious status. This legislation has led to the persecution of smaller religions. A speech entitled 'Religious Persecution in Pakistan' (full speech link) by Shiekh Rahman gave a personal and moving account of the persecution experienced in Pakistan by religious minorities. Particularly pressing upon the exclusion and violence experienced by his own religious community, the Ahmadiyya Muslims. There are draconian laws existing in the Pakistani constitution, contradictory to that encouraged by the Universal Declaration of Human Rights. In Pakistan other religious groups such as Christians, Hindus, Bahais and Shia Muslims have had their rights repeatedly violated in state sanctioned activity. 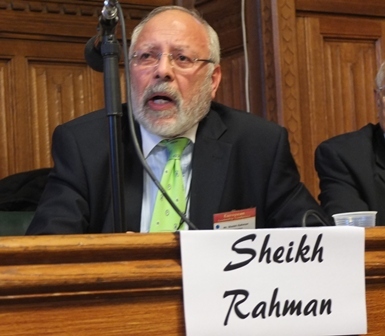 Shiekh Rahman has called for all people present to publicise the persecution occurring in Pakistan, in order to bring it greater international attention and pressure on the Pakistani government to prohibit such practices. Jura Nanuk, Deputy President, Croatian Religious Liberty Association, gave an account of the anti-religious legislation passed in the Hungarian parliament on 14/07/2011, granting the government the right to determine whether a religious community could enjoy religious status. This legislation has led to the persecution of smaller religions. He made a call to all people present to take actions in spreading awareness of the problem by briefing other human rights groups, European legal institutions and to pressure the Hungarian Prime Minister directly on the matter. Sheikh Rahman is an accomplished finance/energy professional and human rights activist. He has had global experience having worked around the world and has direct experience of dealing with a diverse range of issues. He believes passionately in honouring human rights for the citizens of the world. He participates in conferences and remains closely associated with international human rights organisations, politicians, government officials and NGOs to further the cause of human rights, in particular those of Ahmadi Muslims in Pakistan. Peter Zoehrer is Chief Editor & Secretary General of FOREF Europe (Forum for Religious Freedom – Europe, President: Prof. Dr. Christian Bruenner, renowned human rights & constitutional expert). During the past 12 years FOREF scored over 30 victories in helping victims of religious intolerance to regain their rights, and gain vindication from injustice, discrimination or persecution. He is also a Director of UPF –UN office in Vienna, a member of the Austrian Journalist Association (National Press Club) and President of Family Federation for World Peace – Austria. Rev. Dr. Marcus Braybrooke is a retired Anglican parish priest who has been involved in interfaith work for over forty years, especially through the World Congress of Faiths, which he joined in 1964 and of which he is now President. He was Executive Director of the Council of Christians and Jews from 1984-8. He is a Co-Founder of the Three Faiths Forum, Patron of the International Interfaith Centre at Oxford and a Peace Councillor. He has travelled widely to attend interfaith conferences and to lecture. He has studied for a time in India and in Israel. In September 2004, he was awarded a Lambeth Doctorate of Divinity by the Archbishop of Canterbury ‘in recognition of his contribution to the development of inter-religious co-operation and understanding throughout the world.’ He is author of over forty books on world religions and Christianity. Marcus is married to Mary, who is a social worker and a magistrate. They have a son and a daughter and six granddaughters. Together with UPF he has coordinated a series of conferences on the topic of ‘Forgiveness and Reconciliation’.